On paper, Fox’s desire to hold onto the “X-Men” license no matter how iffy it’s boxoffice prospects get makes a certain amount of sense: Owning the “X” franchise gives them first-dibs on their own personal universe of hundreds of characters. In practicality, though, a huge swath of those characters are terrible. Really, really terrible. I’m not even kidding, there’s like maybe 20-25 “good” X-Men people. The rest are kind of a horror-show, conceived in that moment when Marvel could stick pretty much any overdesigned dipshit with an unfortunate haircut on a cover with an “X” in it’s title and it’d sell. 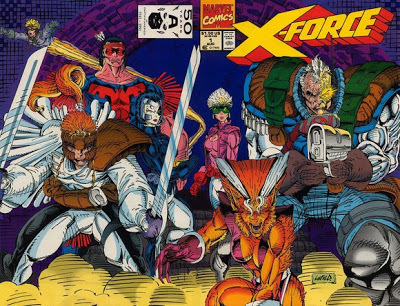 Case in point: They’re apparently going to go ahead and make a film of “X-Force,” at one point the most popular thing in the entire Marvel/Mutants cycle, today often regarded as an unofficial “patient-zero” for everything that went wrong in the 90s (mostly because it’s where Rob Liefeld made his big breakthrough.) The original team was the “all-grow’d-up” version of The New Mutants – who in turn were a teenage team of characters who didn’t quite rate the marquee lineup – organized into a more militarized version of an X-team by Cable, the poster-child for characters whose history is just convoluted enough to distract from how lame he is. Cable’s origin involves time-travel, so one assumes that (unless Fox just plans to stick whichever marketable mutants they haven’t used yet in a movie and call it “X-Force”) this will tie into Bryan Singer’s “X-Men: Days of Future Past” next year.